Grab some dates and some nuts and you’re pretty much good to go. THIS BAR IS about as easy as it comes to make, has less than five ingredients, and if you plan on taking them on a hike on a warm day they won’t melt on you. Surprisingly, you don’t even need to oven bake them so even the most useless of us can produce them without too much fuss. Blend the dates in an electronic blender, adding a few drops of water if the mixture is too dry. Add the cocoa powder while blending until it tastes like chocolate (the exact amount is down to preference). Add the hazelnuts and blend again. At this point it’s possible to add some oats. Again the amount can vary but around 30-40g is okay. This is your mixture. 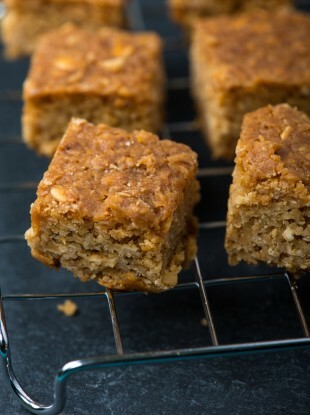 Press into a rectangular tray and cut the individual bars. Once you’ve cut the bars, you can cover them in shredded coconut. It tastes great and helps make them less sticky and easier to unwrap and eat. This is the base recipe but you can make variations. For example, blending some biscuits into the mixture or adding puffed rice cereal works very well. Email “An outstanding energy bar recipe with less than five ingredients”. Feedback on “An outstanding energy bar recipe with less than five ingredients”.